Everyone knows the Mount Vernon Restaurant in Somerville, right? Y'know, that place with the sign as you approach the lower deck of Route 93? But how many have actually BEEN to the Mount Vernon? Yes, tens of thousands of people drive by this classic Somerville restaurant every day on the way to work, but it seems that few know much about it other than the longtime locals in the area and those who know their restaurants. And ironically, the Mount Vernon Restaurant has been around for many decades, so it is by no means a new place on the block that people have yet to discover. But those who do discover the Mount Vernon end up finding a comfortable, family-style restaurant with a hint of classiness that harkens back to an earlier era. The food at the Mount Vernon Restaurant can be described as a mix of classic American fare and pub food. Comfortably familiar dishes such as pork chops, lamb chops, steak and turkey tips, and lobster share the menu with a handful of Italian entrees such as lasagna, ravioli, and chicken parmigiana. And then there is the twin lobster special, which is the signature dish at the Mount Vernon. Only slightly less famous is the delicious roast beef sandwich that patrons have been ordering here since before World War II. Seafood dishes such as the baked scallops and the scrod are fresh and tasty, and portions are generous. Specials can be found at the Mount Vernon every night, including some outstanding soups (the cream of mushroom soup is a real highlight, and finally, give the Sunday morning brunch some serious thought; nearly every food imaginable is available on the buffet tables in the back room, including creamy scalloped potatoes, crispy bacon, pasta dishes, lean ham, and so much more that can be piled high on a buffet plate here. 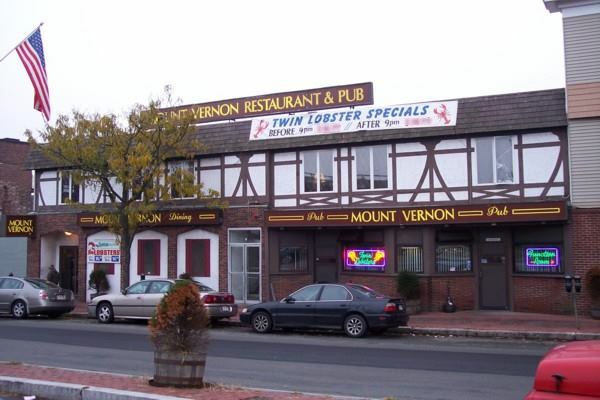 In some ways, the Mount Vernon is an increasingly rare breed of restaurant; it is a dining spot that represents the Somerville of old, when the city's foundation was its close-knit neighborhoods and multi-generational households. This aspect of Somerville still exists in pockets, and the Mount Vernon Restaurant is certainly a part of it, but the "old" Somerville seems to be getting tougher to find with each passing year. If you're looking for a cozy, comfortable restaurant that serves good food at decent prices and is a bit of a throwback, jump off Route 93 south before the Zakim Bridge and see why so many locals dine at this beloved old spot. Copyright © 2005-2017, Boston's Hidden Restaurants (www.hiddenboston.com).